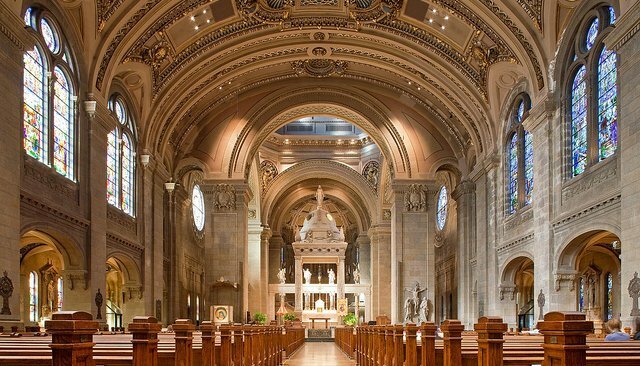 The sanctuary is the holiest part of the church, and it symbolically represents Heaven. This is why the word “sanctuary” which comes from the Latin word “sanctuarium” or “sanctus” means “holy”. 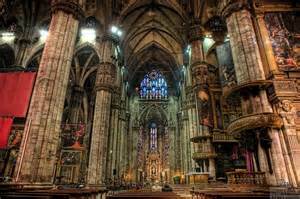 The sanctuary is usually separated from the nave by a Communion rail. 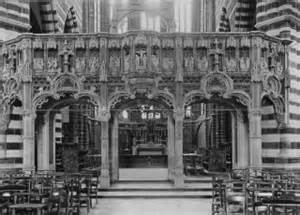 Ages ago, it was common that a tall structure call a rood screen separated the nave from the sanctuary. The rood screen was constructed out of stone, wood, or metal, and was usually pierced with arches or open-fancied art work which allowed those in the nave to see into the sanctuary. Very few of these rood screens exist today because most of these were torn down during the Protestant Reformation since these structures were considered a symbol of Catholicism. The Communion rail in ancient times was often incorporated into the rood screen but today is commonly used as a freestanding structure. The Communion, or altar rail, is actually considered to be an extension of the altar. 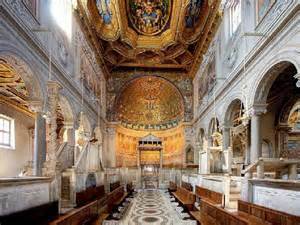 Ideally then it should match the materials and style of the altar. The Communion rail, as an extension of the altar, is covered with a white linen cloth during Communion and is called a Communion or houseling cloth. The Communion cloth takes the place of the corporal at the altar and the top of the Communion rail should be at least six inches, if not more than twelve inches, so that if the Host were to accidentally fall, the friction of the wide cloth would serve as a safeguard against the Blessed Sacrament falling to the ground. The word “ambo” comes from the Greek word, anabaino which means “to go up”, and this refers to a raised pulpit-like or fixed lectern-style structure. This type of pulpit is derived from the practice of the Jewish synagogues where it was used to give sermons. In the Christian tradition it became the place where the Epistle and Gospel were chanted, and thus raised so that the faithful could hear better. Some churches has two ambos, located on either side of the sanctuary or even above on the rood screen which had to be ascended by steps. This is the origin of the name for the chant sung before the Gospel called the Gradual, from the Latin word gradus or step, as this proper would e sung while the deacon (often with the subdeacon, therefore, and acolytes) ascended the steps to the Gospel ambo. In later years the use of the ambo disappeared and the pulpit used for giving sermons came into use. Though there are no official rules for the location of the pulpit, this fixed, raised structure should not be situated within the sanctuary as it can impede the ceremonial movements. Traditionally, this pulpit has been situated either on the outside perimeter of the sanctuary (such as jetting out from the Communion rail), or even placed in the nave against a column.